As does The Witcher 3: Blood and Wine. 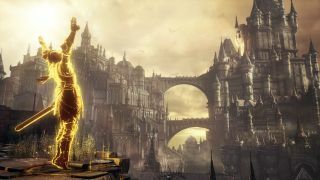 The winners of the 2016 Golden Joystick Awards have been revealed, with the coveted Ultimate Game of the Year title going to the grossly incandescent Dark Souls 3. Elsewhere, Overwatch took home the most awards of the evening, including Best Original Game, Best Multiplayer Game, Competitive Game of the Year, Best Gaming Moment, and PC Game of the Year. Geralt emerged from his bath long enough to claim a bunch of awards for The Witcher 3: Blood and Wine and, hey, an expansion pack winning so many awards is an exceptional thing. Wild Hunt was last year's Ultimate Game of the Year, while Blood and Wine bagged three awards this year, for Best Storytelling, Best Visual Design, and Best Gaming Performance (recognising the fine work of Geralt's voice actor, Doug Cockle). But there's another award heading home with developer CD Projekt RED tonight: one for Studio of the Year.